In order to proceed to the next lab you must first complete all the previous labs (from lab 188 onwards). Pic1. 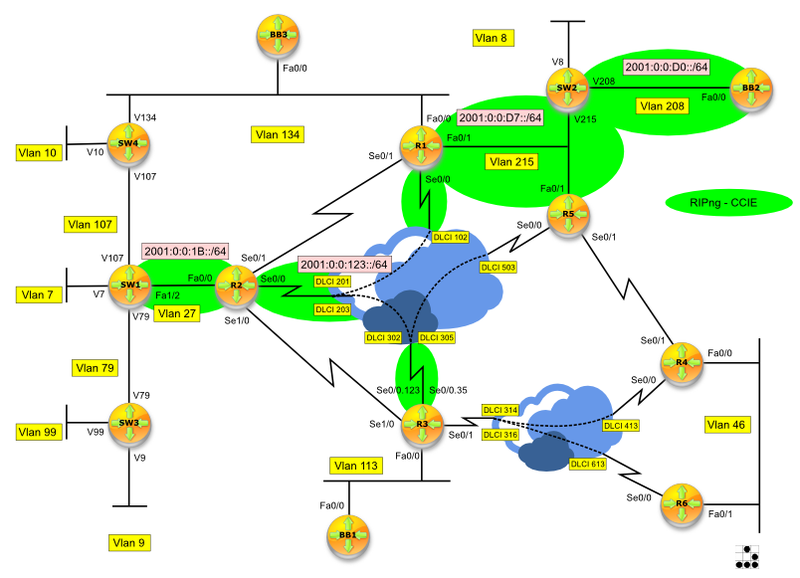 IPv6 Topology Diagram (so far). Document your IPv6 configuration by drawing a topology diagram (similar to mine above). Complete RIPng configuration using name 'CCIE' by enabling the protocol on R3's subinterface connecting it to R2. Be consistent with your current addressing scheme. Ensure R3 can reach all IPv6 networks advertised so far. Since we have used IPv6 autoconfig and EUI-64 way of assigning addresses, you must use your own addresses in the below script. Also, if you use Dynamips/Dynagen/GNS3, every time you start the lab, IPv6 addresses will change which means that your script won't work again. You have to copy the CURRENT IPv6 addresses. Success rate is 100 percent (5/5), round-trip min/avg/max = 4/13/24 ms% Unrecognized host or address, or protocol not running.